Make your life easier with the “Presto Pro SaladShooter". This machine has many options to grate and cut food; it is also fast and easy to wash.
Peel the vegetables in a fast, simple and innovative way with the “Paderno World Cuisine Spiral Vegetable Slicer". You will love this cookware! Use some stable bowls like the “Amco Bowls". Its silicon base makes all the difference. The beauty of this salad is in the contrast of its flavors and colors , since it is prepared with very distinct vegetables. On one side there are strong flavors like the one of the onion, acidic like the one of the lime, refreshing like the one of the cucumber, sweet like the one of the bell pepper and many more flavors. By combining all these flavors and ingredients a very interesting result is achieved. You have to try it! But that’s not all because it is also seasoned with a vinaigrette, that has a flavor that is elaborated and very special . We recommend serving this salad as first course. It is a light plate that can be served accompanied of some toasted bread slices. If you can chop vegetables and mix ingredients you can make this salad. Choose a good cucumber to make the salad. The best ones are the ones that have an intense green color and don’t have spots. This salad is prepared with onion and you can use white or red onion. Make every effort to use extra virgin olive oil so your salad has a finer flavor. The preparation time is of 10 minutes and then the salad is left resting other 10 minutes. 10 minutes and then the salad is left resting other 10 minutes. This recipe serves 4 portions. Cut 1/4 of an onion into strips, put them in a bowl and reserve. Dice 2 tomatoes, pass them to the bowl and reserve. Peel 1 cucumber and then slice it. Upon completion pass it to the bowl and reserve. Discard the veins and the seeds of 1/2 yellow bell pepper. Cut into small chunks the 1/2 yellow bell pepper with the one you worked. Upon completion put it in the bowl and reserve. The vinaigrette is prepared in another bowl so it has a better flavor and the ingredients mix better. Pour the vinaigrette that was beaten in the bowl over the other bowl, where the cucumber salad is. Mix very well the cucumber salad with a mixing spatula. Put in the fridge the cucumber salad and leave it resting for 10 minutes, so the flavors settle and mix. * Keep eating healthy with a vegetarian dish. Suggestion: If you want to enrich the salad, you can put some fresh cheese dices or if you want a more potent flavor of goat cheese. 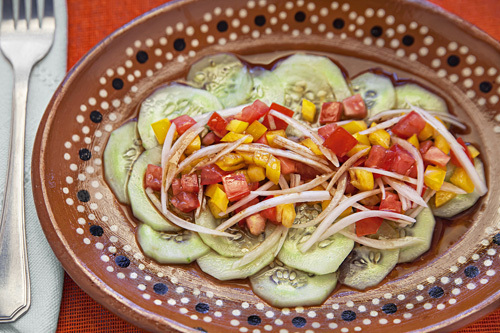 Variation: The cucumber salad can also be prepared with yogurt. Did you like the Cucumber Salad? ➜ After a cold salad a tasty hot Soup. ➜ Check the Mexican Salsas. ➜ As a main course you can enjoy a dish with Pasta. ➜ Don’t forget your Mexican Drink.